Nashville is one of the fastest growing cities in North America today - construction cranes are everywhere. Yet Calgary, even in a recession, could easily give it a run for its money when it comes to creating urban villages. Calgary's East Village blows Nashville's Gulch away as a model 21st century urban community. In fact, Calgary's diversity of urban villages surpass anything Nashville, Austin, Portland or Denver has to offer. Public art a critical and fun part of the revitalization of both Nashville's Gulch and Calgary's East Village. I loved this piece in the Gulch. Every time I passed by someone interacting with it - a sure sign of a successful public artwork. Calgary's East Village is a multi-billion dollar master-planned development just to the east of the downtown core has a vibrant river walk plaza. The Gulch, a LEED Certified community just southwest of Nashville’s downtown, is their most developed urban village with hotels, numerous condos (1,500 homes to date), office buildings, restaurants, clubs and a small urban grocery store. However, it pales in comparison to Calgary’s East Village. It lacks the parks, public spaces, natural setting along a river, transit links and the density of development that makes East Village so special. The Blue Grass Jam at the Gulch's iconic Station Inn live music venue is packed every Sunday night - standing room only. Unfortunately, Calgary's King Eddy Hotel in East Village has been renovated, gentrified and sits empty most nights. Fortunately, East Village's historic Simmons Building along the East Village Riverwalk, has been renovated to accommodate an upscale restaurant, coffee shop and bakery while retaining its historical character. 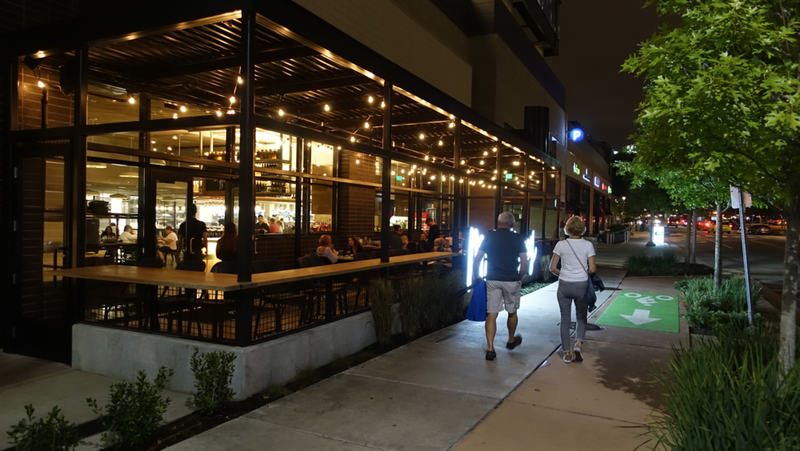 Nashville's Gulch District has several street patios creating an attractive pedestrian experience. Nashville's Gulch has nothing to match the amazing public realm of Calgary's East Village. 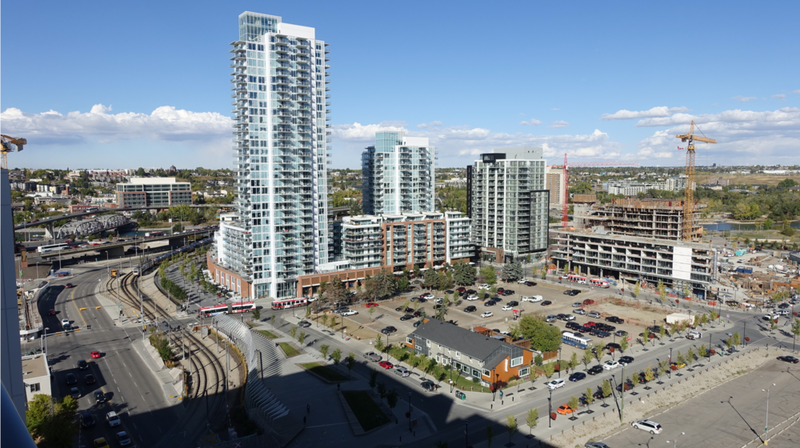 Calgary's East Village is a multi-billion dollar development that will eventually be home to 12,000 residents immediately east of the downtown core. Nashville has nothing to match Calgary's riverside living be it in East Village, Eau Claire or Mission. Many consider East Nashville to be the City’s coolest neighbourhood with its bohemian vibe, including numerous old houses converted to record stores, pizza parlours, guitar and vintage shops. However, the restaurants, shops and clubs are chaotically – there is no real Main Street. Also East Nashville is cut off from downtown - not only by the river but by the huge NISSAN Stadium surrounded by surface parking lots. Calgary’s Inglewood with its historic Main Street, various music venues, Esker Foundation Art Gallery, Recordland, Crown Surplus store and indie shops, is every bit as is cool as East Nashville. East Nashville is dotted with interesting new and old commercial and condo buildings but they are not located in a contiguous manner or with any connectivity. Calgary's Inglewood district is a mix of old and new buildings that are mostly located along 9th Ave SE. to create an inviting 5-block pedestrian street with a mix of retail, restaurants, cafes and live music venues. This building combines retail, restaurant, cafe, offices and contemporary art gallery. Many of East Nashville's corners are waiting to be developed. Inglewood's Main Street aka 9th Avenue aka Atlantic Avenue, Calgary's first commercial street has retained its historical character with major new developments at its east and west entrances. Sandwiched between Vanderbilt and Belmont University is the three-block long 21st Ave S Village. This community has much the same feel as Calgary’s Kensington Village. It even has a historic arthouse cinema - the two-screen Belcourt Theatre. What it lacks though is Kensington’s grocery store, drug store, walkability to downtown and transit connections. Nashville's 12th Ave South district is a lovely 7-block pedestrian zone with a few new condo buildings and high-end retailers and restaurants, but lacks grocery, drug or convenience store. 12 South is Nashville’s upscale pedestrian area that is perhaps best known for being home to Reese Witherspoon’s Draper James shop. Indeed it is bustling street with lots of restaurants, cafes and women’s fashion boutiques. But look a little closer and you’ll see it doesn’t provide the necessities of urban living - grocery store, drug store and professional offices. Calgary’s equivalent would be Britannia with its lovely plaza street that does have a grocery store and other everyday amenities that are required to create a walkable community or Mission/Roxboro. We lived in an Airbnb for 7 days in the 12 South District and our biggest frustration was that it was a 20-minute walk (often without sidewalks) in the other direction to a grocery store. There was no bakery where we could buy bread, bagels or buns (we were disappointed to find out the Five Daughters Bakery was just a donut shop). While I could buy some craft beer, there was no liquor store. Not even a convenience store where you could get some milk, beer and wine. We were very surprised to find there was no live music venue along 12 South, although there was a guitar and drum shop. We found nothing in Nashville has nothing to match the urban lifestyle that Calgary’s Beltline and Mission communities offer, nor did we find any budding new urban villages like Bridgeland/Riverside or Marda Loop. All Calgary urban villages have grocery, drug stores, banks and other everyday services essential to urban living like Marda Loop. The Sutler is part of a cluster of restaurants that a buzzing on weekends at brunch. It is part of an emerging vintage/antique district along 8th Ave South. Several new low-rise condos have recently been built or are under construction along 8th Ave South. Unfortunately 8th Ave South is not pedestrian friendly with poor or no sidewalks to encourage pedestrian traffic. This is the Nashville infill project just off of Charolette Ave at 16th Ave. North with downtown in the background. The Calgary equivalent would be Garrison Woods/Marda Loop with its mix of housing types and commercial development. Nashville has nothing like Calgary's University City with its link to the Brentwood LRT station and University of Calgary. Nashville has nothing like Calgary's Beltline community with its mix of old houses and small apartments, as well as older and modern highrises with several pedestrian streets. Nashville has nothing like Calgary's master planned Bridge's project in Bridgeland/Riverside just northeast of the downtown. Nashville had nothing comparable to Calgary's Kensington Village's mix of retail, restaurants, cafes, condos and single family homes all located near an LRT station. Calgary's 17th Avenue is the equivalent of Nashville's Lower Broadway. If you haven't guessed already, an urban village has a mix of uses - retail, restaurants, recreation, cafes, pubs, live music venues, galleries, theatres, cinemas, bookstores, grocers, drug stores, financial and medical services all within a few blocks. It also includes a mix of housing types - single family, duplex/triplex, row housing and multi-family (mid and hi-rises). They often have one or more employment centres - office, government, school and hospital. Urban Villages are pedestrian oriented often with a Main Street as the meeting place for residents. Calgary has numerous local urban grocers that are key to a vibrant urban village. Calgary has a vibrant independent cafe culture. I left Nashville with a much better appreciation of the importance of creating long contiguous pedestrian streets like 17th Avenue SW or 4th Street SW as part of urban villages. I think Calgary is on the right path with its Main Street program which is looking at ways to foster more pedestrian oriented everyday shopping/services streets throughout the city. My Nashville experience also gave me a better appreciation of the importance of providing the "necessities" of everyday living rather than “just the niceties” when it comes to fostering urban villages. Thirdly, I have a better appreciation for just how well Calgary is doing in fostering the development of new and existing urban villages. Yes, Calgary's collection of urban villages at various stages of development surpass anything Nashville, Austin, Portland or Denver has. Currie is new 195-acre mixed-use urban village (7 kilometres from downtown) under construction that will become home to 12,000 Calgary residents. Photo Credit: Currie Life website. University District a master planned urban community located at the western edge of the University of Calgary campus is currently under construction and will take 15 years to build out. It includes a 9 block Main Street with a Save-On-Foods grocery store and hotel. It will be a mix of multi-family buildings that will become home for 7,0000+ Calgarians (families, seniors, empty nesters and young professional). University District: My Final Resting Place? “They have included everything but the cemetery,” was perhaps the best compliment I heard at the University District’s Discovery Centre when I visited recently. It is amazing how quickly this new inner-city community has gone from approval to construction – Council approved the master plan in September 2014. University District (formerly called West Campus) is all of the vacant University of Calgary land surrounding the Alberta Children's Hospital. University District has been mindfully planned as a multi-generational complete community that will be attractive to people of all ages and backgrounds. While there will be no single-family homes, however it will feature a diversity of townhomes, low rise (under 5 floors) and mid-rise (6 to 12 floors) apartment style homes designed to appeal to baby boomers, families and empty nesters. A key ingredient for a complete community is that the residents’ everyday needs are all within easy walking distance. The grocery store project will include other retail as well as residences and will become the anchor for University District’s nine-block Main Street. It will include everything from the butcher to the banker, from the baker to the candlestick maker. It will also be the gateway to the University of Calgary campus, with all that it has to offer from library, theatre, art exhibitions, lectures, talks, concerts and recreation facilities. The pedestrian and patio oriented Main Street will be linked to the Central Park, which is being designed as an all ages intimate urban playground for the entire community. It will be a place where kids can frolic in the dancing fountain, families can have a picnic, while seniors can enjoy a coffee and people watch. There are also two school sites identified and a working agreement with the Calgary Board of Education for an urban format school (school is located on the ground and second floor, with residential development above) to be developed depending on the demand. Both sites are next to parks so the school playgrounds are also community playgrounds. How mindful is that! In addition to being a walkable community, University District will be transit-oriented with 12 bus stops connecting the residents to three LRT stations, as well as to the University, Foothill Medical Centre, Alberta Children’s Hospital and Market Mall. Recently, it was announced The Brenda Stafford Foundation will be developing a state-of-the-art “ageing-in-place” project where seniors can transition from independent living, to assisted living to extended care all in the same complex. The 217,000 square foot facility is scheduled to open in 2020. In the Fall, the developer for the grocery store / residential project will be announced with groundbreaking happening shortly after. It is my understanding this will be full service grocery store, not a high-priced boutique store with limited product. As well, the hotel project will get the green light by the end of 2017. I also learned the north pond park will be 75% complete by the end of 2017 with the completion in the spring of 2018. The 12 km of pathways that link the north pond park to the sound pond (already complete) are also in place as part of the 40 acres of open space included in the master plan. There are also two designated dog parks, critical to everyday life for many today. Computer rendering of University Districts pedestrian shopping street. The master plan for Calgary’s new University District community has been awarded the highest certification achievable by the Canada Green Building Council. Upon completion, University District hopes to be the third and largest residential development in Canada with a Platinum Certification in Leadership in Energy and Environmental Design for Neighbourhood Development (LEED-ND). It’s a certification that signifies the highest level of sustainability excellence across a wide range of metrics including energy and water consumption, greenhouse gas emissions and recycling as well as community health, connectivity and walkability. What looks like a huge construction site today, will soon be Calgary’s first European style urban village - all multi-family building within easy walking distance to everyday amenities. Calgarians, especially those living in the northwest quadrant have been waiting for something like University District for decades. It will have great appeal to the 25,000+ young and established professional working nearby. As well it will be attractive as empty nesters from the surrounding established communities of Varsity, University Heights, Brentwood, Charleswood, St. Andrew’s Heights, Banff Trail, Briar Hill, Parkdale and West Hillhurst who want the “lock and leave” life style. Given I am in my early 60s and living in West Hillhurst, University District could be my final resting place. West Campus: Calgary's First 24/7 community! You gotta like it when a plan starts coming together - that is exactly what is happening in Bridgeland/Riverside (B/R). It was back in 1999 that Sturgess Architecture completed The Bridges Masterplan for the City of Calgary after the controversial implosion of the Calgary General Hospital on October 4, 1998. Today, Bridgeland/Riverside (B/R) is enjoying an amazing rebirth as a vibrant 21st century urban community. Note: Both St. Patrick's and St. George's Islands are within the boundaries of Bridgeland Riverside, not East Village and Inglewood as most people might think. It is hard to believe this was Riverside 100+ years ago. McDougall Park is a popular place for families to hang out year round. The Bridges is the land made available for development by the implosion included the 10 acre hospital site as well as existing city owned open space to allow for a more comprehensive 37-acre (just a little bigger than St. Patrick’s Island) redevelopment in the middle of B/R community. The ambitious plan was not only Calgary’s first Transit-Oriented Development (TOD) Plan, but Calgary’s first attempt to transform an established early 20th century community into a contemporary 21st century urban village with a higher density and diversity of residential dwellings with ground floor retail or townhomes. The plan consisted of three phases. Yes, even in winter McDougall Park is well used. This phase included eight parcels for condo development, as well as the new Murdoch Park and the General Avenue Plaza. Three of the four parcels along 1st Avenue N.E. are mixed use development with retail at street level and residential units on the upper levels. The fourth parcel, on 1st Avenue N.E. accommodates residential, live-work units and commercial uses. The other four parcels are located on the north side of Centre Avenue N.E. between 7A Street N.E. and 9A Street N.E. are mid-rise residential developments with building heights ranging from 4 to 6 storeys. The buildings emphasize a street-orientation with townhouses at street level and apartments on the upper levels. The Piazza by Townscape Properties Ltd.
Bella Citta & Bella Lusso by Bucci Developments Ltd.
Acqua & Vento by Windmill Developments Ltd.
Pontefino I and II by Sandelwood Development Ltd. This phase includes four sites located between McDougall Road N.E. and Memorial Drive. Two sites are now complete, one is slated for completion in 2017 while the fourth site is under review for a land use amendment and expected to be released for sale in 2018. Three of the sites are designated for multi-family residential development with building heights being five to six storeys. The fourth parcel, adjacent to Memorial Drive, is slated for affordable multi-family housing development. The Bridges Plan was approved after extensive community consultation and if memory serves me correctly, was enthusiastically endorsed by the community who could foresee the benefits not only of a new park, new community centre and new shopping, dining and professional service amenities, but of new residents who would hopefully revive the community. The Bridges has not only transformed the area around the old Calgary General Hospital into an urban village, but also Edmonton Trail has been revitalized with numerous new condo developments. Fast-forward to 2017. The Bridges has indeed been the catalyst to transform Bridgeland/Riverside into one of Calgary’s most desirable communities. In fact, it was chosen as Calgary's #1 Community in the Calgary Herald's 2017 Readers' Choice Awards. B/R's Tool Library is just one of the many ways residents are working together to create a sharing community. As an avid Twitter reader, I am constantly impressed by what is happening in B/R. Bridgeland Betty is always tweeting out the fun things to do in her community, things like their Tool Lending Library, evening walks to learn about the community’s amazing array of churches and the Vegan/Gluten-Free Stampede Breakfast. Today, B/R is home to some of Calgary’s coolest places – Cannibale with its barbershop in the front and cocktail lounge in the back, Bike and Brew where coffee and bike cultures meet and Luke’s Drug Mart that is a drug store/post office/ grocery store/record store/general store/café. Lukes is one of three grocers in B/R, the others being Bridgeland Market and Blush Lane Organic Market, a sure sign hipsters and YUPPIES have invaded this once sleepy community. The most interesting B/R project I learned about on Twitter recently was their 4th Avenue Flyover Project. So intrigued by the photos of children painting the roadway under the flyover, I had to check it out myself. The 4th Street Flyover plan now approved by the City of Calgary will see the development of a fun park (McDougall Rd NE and Edmonton Trail) under the concrete flyover complete with a rain garden, public art, sidewalk patios and colourful painting of the concrete abutments. It will be a unique urban, all ages PLAYground developed as a result of an amazing collaboration between the community’s Grade 6 Langevin School students and Landscape Architect students at the University of Calgary. McDougall Road's new funky streetscape. LRT Stations in the middle of major roads are not pedestrian friendly. A check of the City of Calgary’s Community Profile demonstrates the community’s population is growing again, after years of decline and stagnation. It grew by 8% from 2012 to 2016, vs City of Calgary’s 10% increase. It has become a very cool community for young families. In fact, 7% of the B/R’s population is under 4 years of age, the same as the City of Calgary’s. However, only 6.5% of B/R’s population is between ages 5 to 19, significantly lower than the 18% City average. It will be interesting to see if today’s young families remain in B/R and embrace the urban living lifestyle or do they migrate en masse to the outer suburbs for cheaper, bigger homes to raise their growing families as previous generations have done. Monument to Calgary General Hospital with Calgary Tower in the background. Altadore: Opportunity to create model 21st century community. Intelligent Infilling or Living in a bubble? I have a new appreciation for both transit-oriented living and Google Maps after spending a month in Berlin where everywhere we wanted to go was EASILY accessible by transit. I was amazed how easily we could get to hundreds of museums, tourist attractions, parks, shopping and even IKEA by transit in a totally unfamiliar city. One key to transit oriented living is a transit system that offers 5 minute or less service. It can be buses, subways, trams or LRT as long as it is frequent. I simply typed in where I wanted to go in Google Maps and it told me the route and how long it would take to drive, cycle, walk or take transit. In almost every case, transit was the best option. The station (or bus stop) was always less than a pleasant five-minute walk and when we arrived, transit was there in minutes. Though, Google Maps tells you when the next bus, train or tram will arrive at a particular stop, I just ignored that information, as transit was so frequent, it didn’t matter. It also didn’t seem to matter if we needed to take couple of trains or a train and bus, as connections were seamless. Note the differences in time between driving, cycling and transit. When you add in time to get to your car and find a place to park driving becomes even less attractive. Berlin transit offers a number of different payment options – single fare, daily fare, weekly and monthly passes (with even a non-prime time option for those travelling after 10 am weekly or monthly passes). How good is that! Another great thing about Berlin’s transit system is that the trains seem to drop you off in the middle of the action, not at the edge as they do in Calgary – take Stampede, University, Chinook, Anderson and even Bridgeland stations for example. A great transit system benefits drivers too. I was shocked when, taking the bus at rush hour, it never had to wait for more than one traffic light. More people using transit means more road capacity for those who have to drive, which in turn means less rush hour traffic jams. Good transit systems have good connections and attractive places to wait. In Berlin, transit is decentralized, to best serve the mini-downtowns scattered throughout the city. In contrast, Calgary’s transit is downtown-centric i.e. almost all transit is oriented to get people downtown. However, only 25% of the people work in the greater downtown area and 5% live there. The City of Calgary’s Go-Plan back in the mid-90s, actually did call for the development of mini-downtowns at the edge of our city next to new LRT Stations. Somehow they instead became big box power centres. I often wonder how different urban living would be in Calgary if late 20th and early 21st century suburban power centres were designed as walkable mini downtowns, each with a mix of multi-storey retail, restaurants, residential and recreational buildings, rather than so car-oriented retail centres. It is ironic that today, Currie Barracks and University District are both being developed as mini-downtowns yet neither has or will have a LRT Station. This map of the Berlin's Transit system illustrates not only how extensive the system is, but also how decentralized it is. To be fair, Calgary has plans to develop its LRT and BRT service with more crosstown routes in the future. Today only the Blue and Red lines exist. While Calgary is in its infancy when it comes to creating mixed-use communities next to LRT Stations, Berlin is arguably the guru of TOL. Instead of surrounding transit stations with massive residential highrises that block the sun, create wind tunnels and dwarf pedestrians, Berlin’s transit stations are usually in the middle of a platz (plaza) that allows for various programming – usually a farmers’ market and/or flea market – but most of the time just a gathering/meeting place for locals and tourists. I loved that each platz in Berlin has its own character and charm, its own sense of place. Five minute service even at 10 am. A good example is the Alexander Platz. While the history of the area around this platz dates back to the 13th century, most of the existing buildings are relatively new as the area was destroyed during WWII. The revitalization of the Alexander Platz began in 1969 with the construction of the Berliner Fernsehturm TV tower. Topping out at 368m tall, it has a viewing platform at 203m and revolving restaurant at 207m, which is very similar to the Calgary Tower. Today, it is a vibrant pedestrian zone, surrounded by a major subway train station, as well as several, “at grade” LRT lines. It is also home to major department stores Galleria Kaufhof and Primark, the ALEXA shopping centre and several smaller shops all facing onto the huge plaza. It is a shopping/tourist mecca 7 days a week. Alexander Platz is full of people at 10 am on a weekday even when there are no special events. Alexander Platz is surrounded not only by several transit stops and a major station, but it has a diversity of things to see and do including cinemas, shopping and tourist attractions, not just condos and apartments. Ironically, Calgary’s downtown urban renewal project also started in the late ‘60s with a tower – Husky Tower, now the Calgary Tower. It also included Palliser Square (retail, cinemas, offices and parkade), as well as the Calgary Convention Centre, Four Seasons Hotel (now the Marriott) and Glenbow Museum complex. Then 8th Avenue SW became the Stephen Avenue pedestrian mall; 7th Avenue became the downtown transit corridor, which was followed by the opening of the Performing Arts Centre and finally Olympic Plaza, our equivalent of a platz. Unfortunately, Calgary’s late 20th century urban renewal didn’t include the residential part of the transit oriented living equation that is critical to evening and weekend urban vitality. As well, Olympic Plaza has never really captured the imagination of Calgarians except when hosting a major festival or event. It is not a place where Calgarians meet and linger. It is not a place we take visitors to showcase Calgary’s unique sense of place. It is not a mecca! Olympic Plaza is pretty to look at but it doesn't attract people outside of special events and weekday noon hours when office workers enjoy an outdoor lunch. Olympic Plaza on a nice Saturday in spring is devoid of any urban vitality as most of the buildings surrounding it are closed or have limited activity. While there is a large apartment building, museum and hotels nearby, it doesn't have the everyday appeal that a public plaza should have. Berlin’s platze seem to be busy all the time and without any special programming. Berlin’s planners, developers and politicians seem to understand how to integrate transit, residential, commercial and public space to create lively and liveable urban places. Instead of focusing on Transit Oriented Development (TOD) Calgary and other North American cities should be focused on Transit Oriented Living (TOL) i.e. what makes living next to a train station or transit hub a great place to live? Too often the current focus in on creating high-rise and mid-rise condos next to the station, but TOL is more about “diversity of uses” than density. Density without diversity is sterility. If you have a chance, visit Berlin and experience transit-oriented living for yourself. Note: This blog was originally published in the New Condos section of the Calgary Herald on Saturday July 16, 2017. Transit Oriented Living allows you extra time to relax and read. I was amazed at how many people I saw reading books on the trains in Berlin. Should Calgary Transit Think Outside the Bus? As a result of digging into the Calgary Transit’s “Electronic Fare Saga,” I also learned a whole lot more about the other issues that Calgarians and Calgary Transit are facing in a March 2016 report "Calgary Transit Service Delivery Goal Trends and Challenges." Base service is a range of transit services (feeder, mainline and cross-town routes) providing service, within 400 metres of 95% of residents and jobs, at least every 30 minutes. In 2015, base service is provided to only about 60.4% of Calgary residences and 62.7% of businesses. I was surprised to learn there are thousands of households in 12 different Calgary communities that no have no service within 5 kilometers and probably won’t have for a few years. I can understand that new communities might have to wait for schools, libraries and recreation centers, but I have to wonder why the City would approve the development of a new community if they know they don’t have the money to provide reasonable transit service. I wasn’t surprised to learn that most bus routes after 9 pm operate at less than 20% capacity (i.e. less than 12 people per bus). My observations over the years have found that in off peak times it is more like 5 or 6. For a long time I have wondered if there isn’t a better way to provide transit service on low ridership routes. What if taxis, Uber drivers and/or car2go vehicles waiting at the LRT Stations were somehow included in the transit fare so C-Train riders could just hop in and get home rather than waiting for a bus that comes every 30 minutes? I then started thinking of lots of questions? Would it be more cost effective for the city to just tendered out transit service to taxis, Uber or car2go from C-Trains Stations late at night? Would it make sense to replace some low occupancy bus routes with taxis and Uber service to the nearest C-Train Station at night? Would it be cost effective to tender out transit service to new communities to taxis and Uber, while a community grows in size to warrant transit service? Would the Taxi/Uber option be cost effective on low ridership routes on the weekends? I hazard a guess to say transit users would love the door-to-door, on-demand service at night, especially in the winter. Waiting in the dark and cold is no fun. Increased C-Train ridership at night as a result of Calgarians being picked up at home and driven to the closest C Train or picked up at the LRT Station and driven home could result in increased train service, yielding a win-win situation. As well, it would be more environmentally friendly as buses wouldn’t be driving around empty and taxis and Uber drivers would be busy driving people, rather than sitting idling polluting the air while waiting for a fare. Taxi drivers get a new client base, maybe making up for the Uber competition. There could also be an increase in transit use by car owners with the added comfort and convenience of door-to-door on-demand service. Fewer cars on the road would be a good thing. The records of the taxi and Uber drivers would provide the City with valuable information for future transit planning. And yes, it should save the taxpayer money. In fact Miami, Denver, Quebec City and Phoenix already have partnerships with private companies (Uber, Lyft) to transport customers to and from transit services in low ridership areas or during times of low ridership (evenings & weekends). Perhaps a pilot project in Calgary is warranted based on the lessons learned from these other cities. Perhaps it is time to think outside the bus. 80% of Calgarians must live in the 'burbs! Calgary is evolving into five cities? Over the past few months, I have done a Q&A with Greg Morrow, an urban growth academic at the University of Calgary and Chris Ollenberger, an experienced Calgary developer about Calgary’s community engagement process. To close the circle, I thought a Q&A with a community leader was needed. Recently, I met with Elise Bieche President of the Highland Park Community Association who has been leading the community’s response to the redevelopment of the Highland Golf Course. I was impressed with her professionalism - no ranting, no name-calling and no unrealistic demands. Centre Street is already a busy bus route, in the future it will be home to the new LRT Green Line. Q: What are your biggest frustrations with the City’s current community engagement process? The fact the engagement process wasn’t lead by the City’s administration from the beginning. The developer “hosted” some engagement sessions, asked for the community’s feedback on two options and then things went really silent for a long time. We learned, after the fact, what the developer submitted to the City didn’t resemble what the community “endorsed.” Then as the file was being completed to submit it to Planning Commission, the City hosted an “information session.” This gave residents the false belief their feedback would be incorporated into the final submission, but it was too late. We were frustrated we were never able to easily access the file as it progressed through the City’s approval process. The community wasn’t treated as a key stakeholder. Highwood Golf Course tree-lined fairway. Q: What changes would you like to see in how the City implements in their engagement process? I believe the City should own the engagement process from the beginning when big developments are first proposed in established communities. This is a 50-acre site that will radically change our community and the entire north central area of the city over the next 25 years. I think the City had an obligation to seek feedback from the community early and understand what we valued to ensure the development is complementary to both the topography of the site and existing community. I think the City should be obligated to respect and incorporate the community’s feedback wherever possible. There needs to be a mechanism in the community engagement process that when major changes have been made to the proposed development after the community has endorsed it, then there must be a re-engagement with the community before it goes to Planning Commission. In our case, the community was presented with slope adaptive buildings, the re-establishment of the buried creek and a density of 1600 in the original plan. All of these were important to the community yet were missing both in the Planning Commission and City Council submissions. Our community recently participated in a charrette for the Green Line’s 40th Ave North Station (includes the Highland Golf course redevelopment site) organized by the City and lead by Gary Andrishak from IBI’s Los Angeles office. It was very useful. and should be the model for community engagement. I believe a charrette should be done as early as possible with the community, developer and city to foster a shared vision and key principles to guide major developments in established communities. Highwood development is closer to downtown than many people think...that is the Bow Tower in the background. Q: What changes would you recommend to developers in engaging with a community where they are proposing a major new development? Make sure you are doing genuine engagement. The community is not your enemy; we should and could be your ambassadors. I am positive getting community support early would save the developer and City money not only during the approval process but also as the project is being built. Don’t think you can “outsmart” the community - be transparent throughout the process. It’s really important for there to be integrity in the entire planning process. A developer should not present options to a community and then take something completely different to administration. I think developers have an obligation to ensure they aren’t “falsely advertising” something to the community. I would highly recommend developers spend more time in the community and get to know the community before they develop their plan. Find out what the issues are and talk to key individuals. Old multi-family housing on the west edge of the golf course. Q: How do you respond to the claims by some that the Highland Park’s community’s protest to the golf course redevelopment is just another case of NIMBYism? If you look closely, our neighbourhood is very much in favour of the development of the golf course. Our community was also in favour of the Centre Street alignment of the Greenline. We just want quality redevelopment. Volunteers from our community have literally put in thousands of hours on this issue because we learned early on we could not rely on City administration to represent our interests. Communities are often criticized for being too vehement about their wants and desires, but ultimately the poor engagement process forces communities into this role. I think the City’s community engagement process fosters NYMBYism by allowing the developer and administration to develop the initial site plan without the community at the table. This means when the draft plan is presented to the community they have a lot of catching up to do and when they question or reject some or the entire proposed plan they are immediately labeled as NYMBYist. That is not fair. I also think the planning process shouldn’t be just focused on just the proposed project but should look at it within the context of the entire community. You can’t evaluate a 50-acre site properly without evaluating how the proposed development will impact the pre-existing community. Q: What advice would you give other Community Associations in established communities facing major developments? Get involved as early as possible in the planning process. Be constructive, reasonable and respectful at all times. Accept development is going to happen. Taking a position of “no development” is not a reasonable option. Learn as much as you can about the complexities of the City’s development approval process, as well as how the Calgary Municipal Development Plan and Province’s Municipal Government Act apply to the site’s development. Ask lots of questions of your community, the developer and administration. Accept the new development will not right all the wrongs of the past. Be prepared to ensure mistakes of the past aren’t repeated, especially when it comes to green space. Don’t expect City Administration to look after your community’s interests. Be prepared to review and comment on documents on short notice. Foster a good relationship with your Councillor. In chatting with Bieche, a couple of new ideas were hatched. What if the City hired third-party professionals to manage all future community engagement so there is no conflict of interests? The City and the developer would share the costs 50/50. Ideally, a standard community engagement protocol should be developed so all communities would be treated equally when a major new development is being proposed. We also wondered if there may be a role for the Provincial government to play given ultimately some of the development issues are governed by the Municipal Government Act. Perhaps the funding of the community engagement process then should be a third, a third, a third. Something to think about?